All transactions are safe and secure with a reliable history in online purchasing behind each of our associates. 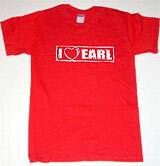 Buy the I Love Earl t-shirt to own My Name is Earl clothing and merchandise. Available in red or black, the design on the front of this My Name is Earl t-shirt helps to express your admiration for Earl Hickey. Whether you share his belief in what goes around comes around, or you simply never miss an episode of the TV show, this I Love Earl tee will help to convey your devotion. Tell your friends that you know the Crab Man and that you can get free snacks at Ernie's Crab Shack. In addition to the I Love Earl tee above, browse the My Name is Earl Clothing Gallery for more apparel like men's and women's clothes, kids shirts or hoodies.